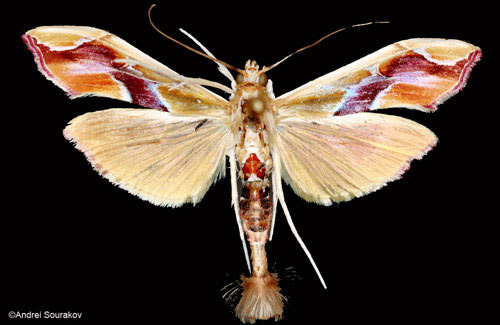 Although little known, the Erythrina moths Terastia meticulosalis Guenée and Agathodes designalis Guenée represent a remarkable case of niche partitioning (Sourakov 2011). In Florida, throughout the southern United States, and from Mexico to Argentina, these two species feed on plants of the genus Erythrina (Fabaceae). This genus, while mostly known as attractive ornamentals, has medicinal and other uses (Powell and Westley 1993). 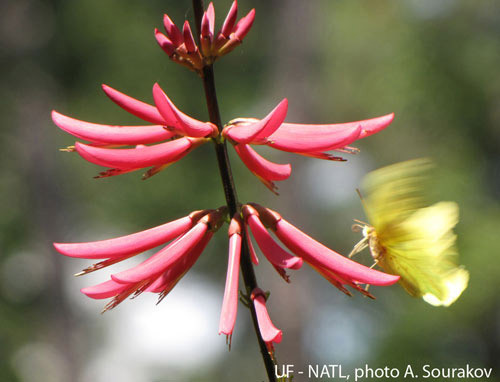 The descriptions of the moths' life histories below are based on north-central Florida populations that use the coral bean, Erythrina herbacea, as a hostplant. This plant is not only native to the region, but is also frequently used as an ornamental. Figure 1. An adult Erythrina stem-borer, Terastia meticulosalis Guenée. Photographed in Gainesville, Florida. Photograph by Andrei Sourakov, University of Florida. There are four other species within the genus Terastia. In the past, Terastia subjectalis (found in Australia and throughout Asia) had been considered a synonym of Terastia meticulosalis, but now is listed in modern literature as a separate species. The taxonomic status of Terastia meticulosalis populations in Africa, where it is listed from Kenya, South Africa, Uganda and Sierra Leone, is unclear. There are nine other species of Agathodes described. For example, Agathodes ostentalis, similar to Agathodes designalis, is found throughout Asia and Australia. 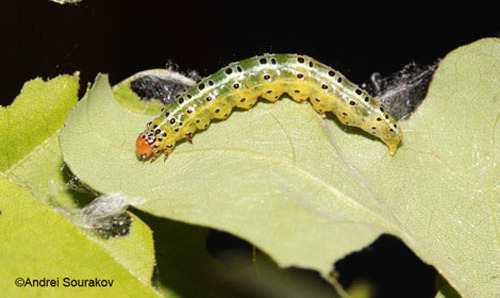 Larvae of Agathodes ostentalis also feed on Erythrina, but are different in appearance from those of Agathodes designalis. In Florida, and throughout the North American populations, Agathodes designalis is represented by the subspecies Agathodes designalis monstralis, while Agathodes designalis designalis was originally described from South America. Additional work on the genus, including new methods such as the DNA barcoding, is likely to change current classification of the genus (Dan Janzen, pers. com.). For instance, larvae of Agathodes designalis in Costa Rica are different from those in Florida, perhaps emphasizing the underlying taxonomic differences (Janzen & Hallwachs 2011; Sourakov 2011). Figure 2. An adult Erythrina leaf-roller, Agathodes designalis Guenée. Photographed in Gainesville, Florida. Photograph by Andrei Sourakov, University of Florida. Both species are found from South Carolina to Florida in the eastern United States, west to Arizona, and then south to Argentina. In Florida and throughout the southeastern United States, both species are quite distinct, but in collections they can be confused with members of the same genera, which are distributed world-wide. Adults: In Terastia meticulosalis, size depends on the generation and locality, and therefore the diet, of the caterpillars. For instance, in Florida, the Spring generation that feeds on seeds was shown to be larger than the Summer and Fall generations that feed inside the stem. The wing span for Spring generations was ~1.4 inches (3.7 cm) versus ~1.2 inches (3.0 cm) for Summer generations, and as small as ~1.0 inches (2.5 cm) in Fall generations. (Sourakov, 2011). Collection specimens from South America are notably larger (~1.8 inches or 4.6 cm). 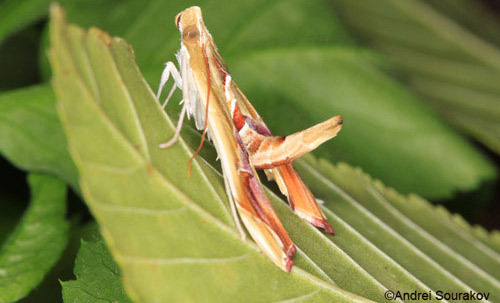 The marbled-brown forewings of Terastia meticulosalis make this species cryptic when at rest. However, its hind wings are white, as seen above. Figure 3. An adult Erythrina stem-borer, Terastia meticulosalis Guenée. Photographed in Gainesville, Florida. Photograph by Andrei Sourakov, University of Florida. Eggs: The oviposition of Terastia meticulosalis has not been described. 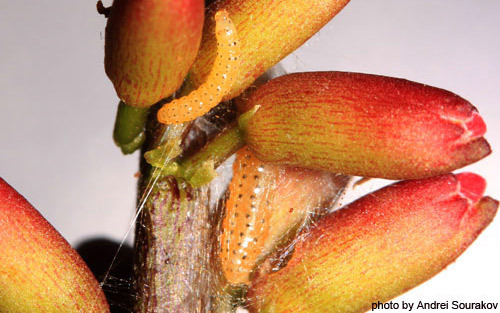 Larvae: The young larvae of Terastia meticulosalis are found inside the stems of Erythrina herbacea, where their feeding produces a characteristic dying-off of the tip of the host plant. The infestation rate by Terastia meticulosalis can be relatively high. As the availability of undamaged shoots of Erythrina herbacea declines, neonate larvae bore and feed inside the leaf stalks and later make their way inside the stems. Figure 4. Erythrina herbacea in July, showing a characteristic dying off of the stem as the larva of Terastia meticulosalis Guenée burrows downwards. Photographed in Gainesville, Florida. Photograph by Andrei Sourakov, University of Florida. In younger larvae, the dorsal prothoracic plate and the head are black and heavily sclerotized. 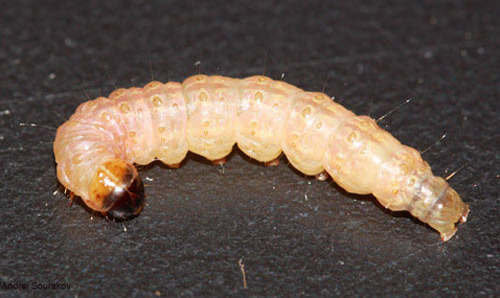 In older larvae, the prothoracic plate becomes cream-colored, slightly darker than the rest of the body, which is otherwise translucent and cream-colored. Figure 5. Second instar larva of Terastia meticulosalis Guenée. Photographed in Gainesville, Florida. Photograph by Andrei Sourakov, University of Florida. In the Spring, young larvae of Terastia meticulosalis infest the tips of the stem and gradually kill off the upper part of the plant, from where they move into the pods to feed on seeds. Figure 6. Third instar larva of Terastia meticulosalis Guenée, Spring generation. Photographed in Gainesville, Florida. Photograph by Andrei Sourakov, University of Florida. Prior to pupation, last instar larvae are able to consume large numbers of seeds and move from one pod to another. 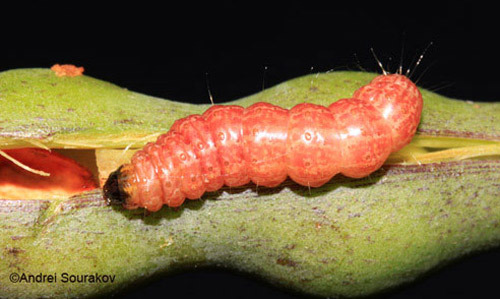 Larvae of Terastia meticulosalis sometimes accumulate red pigments prior to exiting pods to pupate on the forest floor. However, this was only observed in the Spring generation that feeds on seeds (Sourakov 2011). Figure 7. 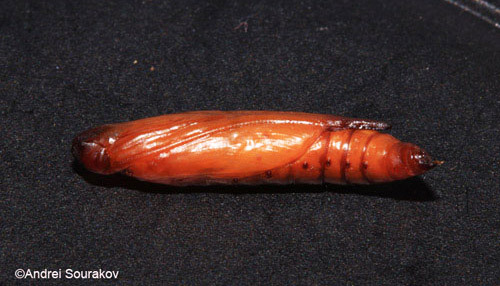 Prepupa of Terastia meticulosalis Guenée. Photographed in Gainesville, Florida. Photograph by Andrei Sourakov, University of Florida. The larvae of Summer and Fall generations of Terastia meticulosalis feed inside the stems until pupation (the seeds become hard and pods splits open during this time). Hence, the Summer/Fall larvae look paler than Spring ones. Figure 8. Mature larva of Terastia meticulosalis Guenée, hollowing the stem of Erythrina herbacea, Summer/Fall generations. Photographed in Gainesville, Florida. Photograph by Andrei Sourakov, University of Florida. Figure 9. Mature larva of Terastia meticulosalis Guenée, Summer/Fall generations. Photographed in Gainesville, Florida. Photograph by Andrei Sourakov, University of Florida. Figure 10. Head and thorax of mature larva of Terastia meticulosalis Guenée, Summer/Fall generations. Photographed in Gainesville, Florida. Photograph by Andrei Sourakov, University of Florida. Figure 11. The larva of Terastia meticulosalis Guenée purges the hollow stem of Erythrina herbacea from frass by crawling backwards to the entrance when defecating. Photographed in Gainesville, Florida. Photograph by Andrei Sourakov, University of Florida. Pupae: Terastia meticulosalis makes loose double-layered cocoons. The pupa is cream-colored at first, and then becomes light brown, with the proboscis extending far into the abdominal segments. Figure 12. 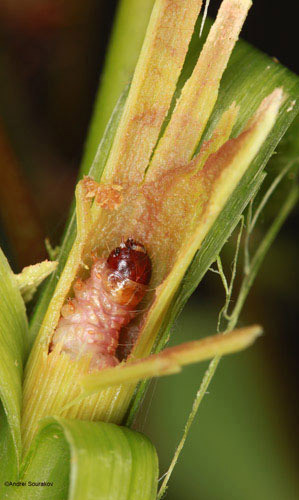 The pupa of Terastia meticulosalis Guenée inside its cocoon. Photographed in Gainesville, Florida. Photograph by Andrei Sourakov, University of Florida. Figure 13. The pupa of Terastia meticulosalis Guenée, lateral view. Photographed in Gainesville, Florida. Photograph by Andrei Sourakov, University of Florida. Figure 14. The pupa of Terastia meticulosalis Guenée, ventral view. Photographed in Gainesville, Florida. Photograph by Andrei Sourakov, University of Florida. Adult: Agathodes designalis specimens reared in Florida and Costa Rica are ~1.2 inches (3.0 cm) in wing span, but specimens from South America found in collections can be larger. The purple-and-green marbled forewings of Agathodes designalis are colorful, while the hind wings are beige. The abdomen is held in an up-right position, which gave the moth an unofficial common name of "sky-pointing moth." 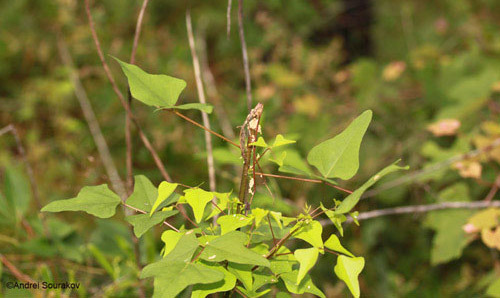 Males have a pair of hair-pencils that are extended during "female calling," for the release of pheromones. Figure 15. An adult Erythrina leaf-roller, Agathodes designalis Guenée. Photographed in Gainesville, Florida. Photograph by Andrei Sourakov, University of Florida. Eggs: Eggs of Agathodes designalis are laid singly on the ventral side of the leaf (Bourquin 1945). Larvae: Young larvae of Agathodes designalis are translucent and orange with six rows of short, black-sclerotized tubercles, and are cryptic. Figure 16. 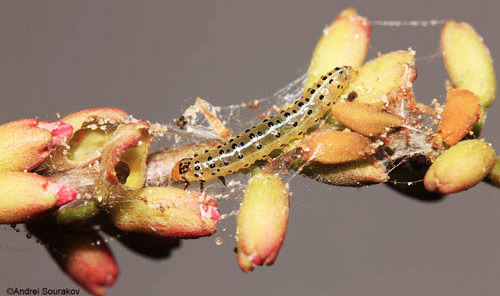 Webbing of the first and second instar larvae, Spring generation, of Agathodes designalis Guenée over the inflorescence of Erythrina herbacea. Photographed in Gainesville, Florida. Photograph by Andrei Sourakov, University of Florida. Figure 17. Fourth instar larva, Spring generation, of Agathodes designalis Guenée feeding on the inflorescence of Erythrina herbacea. Photographed in Gainesville, Florida. Photograph by Andrei Sourakov, University of Florida. 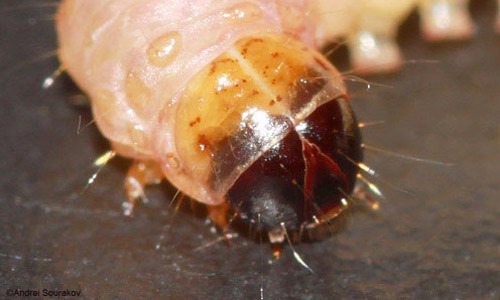 The later instar larvae and prepupae appear aposematic. They develop cream-colored longitudinal stripes and the black tubercles become more prominent on the orange background, while the head is bright red. Figure 18. 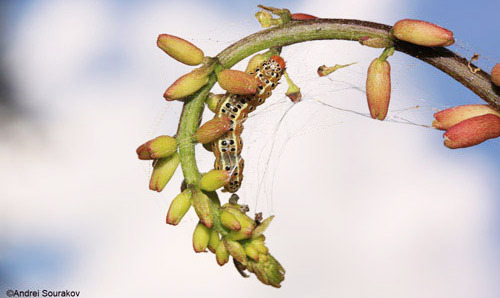 Mature larva, Spring generation, of Agathodes designalis Guenée feeding on the inflorescence of Erythrina herbacea. Photographed in Gainesville, Florida. Photograph by Andrei Sourakov, University of Florida. Figure 19. 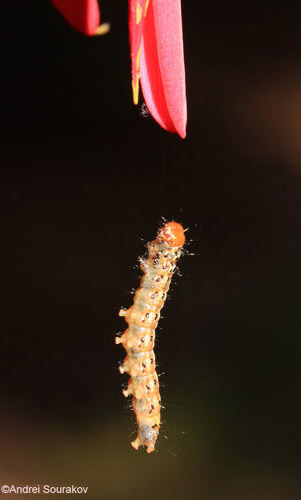 Mature larva, Spring generation, of Agathodes designalis Guenée suspends itself by a silk thread after falling off the host plant, Erythrina herbacea. Photographed in Gainesville, Florida. Photograph by Andrei Sourakov, University of Florida. Figure 20. 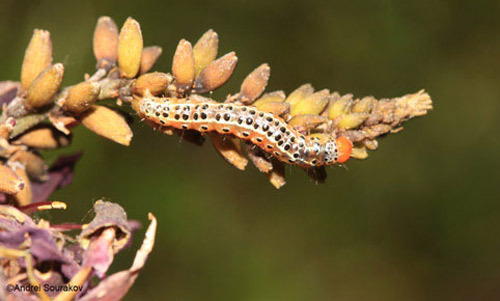 Mature larva, Spring generation, of Agathodes designalis Guenée feeding on the inflorescence of Erythrina herbacea. Photographed in Gainesville, Florida. Photograph by Andrei Sourakov, University of Florida. Figure 21. 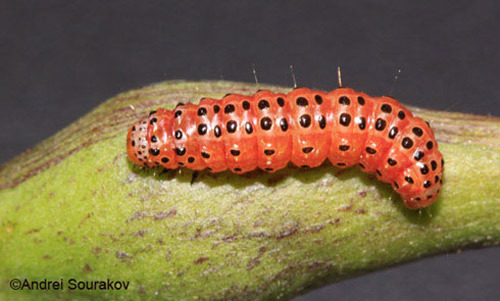 Prepupa, Spring generation, of Agathodes designalis Guenée changes color after feeding on the inflorescence of Erythrina herbacea. Photographed in Gainesville, Florida. Photograph by Andrei Sourakov, University of Florida. Summer and Fall generations of Agathodes designalis feed on leaves and develop slower than the Spring generation that feeds on flowers, which indicates the higher nutritional value of their Spring diet. Figure 22. Mature larva, Summer generation, of Agathodes designalis Guenée inside a shelter made from from the leaves of Erythrina herbacea. Photographed in Gainesville, Florida. Photograph by Andrei Sourakov, University of Florida. Figure 23. 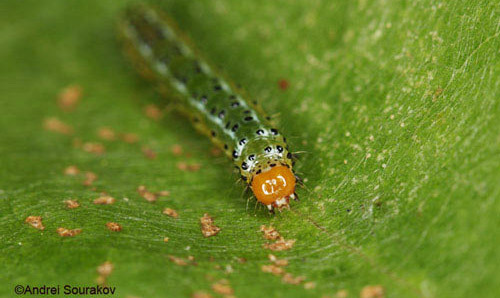 Dorsal view of a mature larva, Summer generation, of Agathodes designalis Guenée feeding on leaves of Erythrina herbacea. Photographed in Gainesville, Florida. Photograph by Andrei Sourakov, University of Florida. Figure 24. 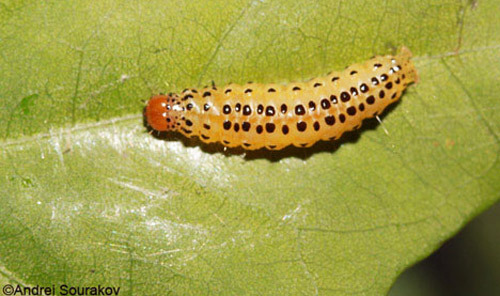 Lateral view of a mature larva, Summer generation, of Agathodes designalis Guenée feeding on leaves of Erythrina herbacea. Photographed in Gainesville, Florida. Photograph by Andrei Sourakov, University of Florida. Figure 25. 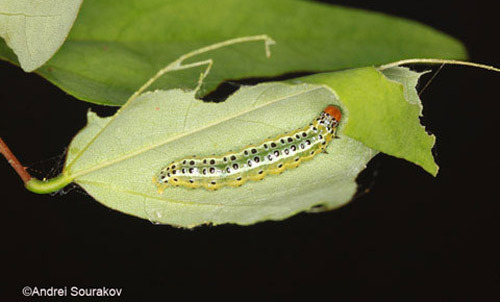 Frontal view of a mature larva, Summer generation, of Agathodes designalis Guenée feeding on leaves of Erythrina herbacea. Photographed in Gainesville, Florida. Photograph by Andrei Sourakov, University of Florida. 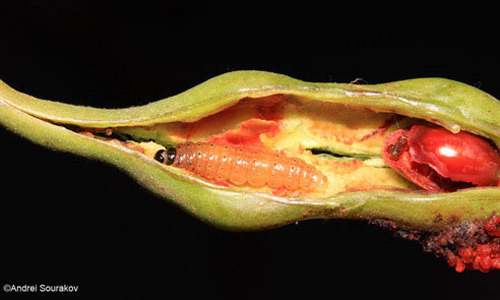 In the Spring generation that feeds on flowers, the prepupa can become red. The prepupae of Summer and Fall generations are cream-colored. Figure 26. 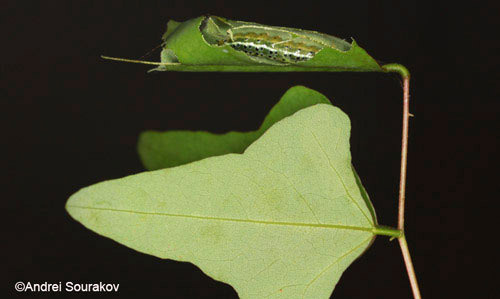 Prepupa, Fall generation, of Agathodes designalis Guenée on Erythrina herbacea. Photographed in Gainesville, Florida. Photograph by Andrei Sourakov, University of Florida. There are four generations of Agathodes designalis between May and September in north-central Florida. 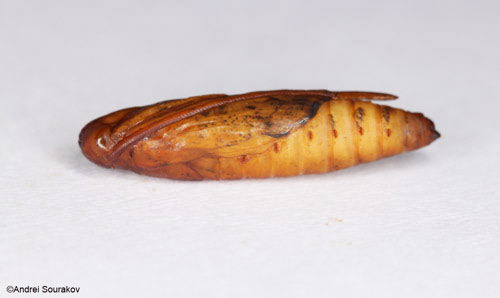 Larvae of Agathodes designalis collected in Gainesville, Florida in September completed their feeding by mid-October, and diapaused in a prepupal stage inside cocoons (Sourakov, 2011). The diapause might not be present in the warmer parts of the moth's range, or might occur in different seasons. Pupae: Agathodes designalis makes loose double-layered cocoons similar to these of Terastia meticulosalis, and the pupa, though it appears more glossy and more uniformly colored brown, is otherwise similar to that of Terastia meticulosalis. Figure 27. 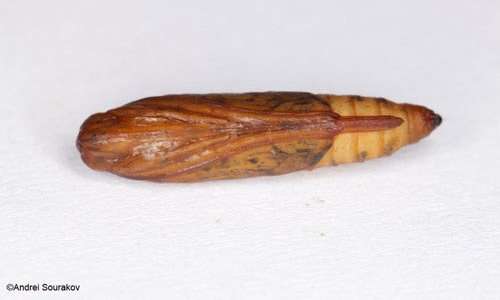 Lateral view of pupa of Agathodes designalis Guenée. Photographed in Gainesville, Florida. Photograph by Andrei Sourakov, University of Florida. Figure 28. Coral bean, Erythrina herbacea, a host plant of Terastia meticulosalis Guenée and Agathodes designalis Guenée. Photographed in April at Gainesville, Florida. Photograph by Andrei Sourakov, University of Florida. Figure 29. 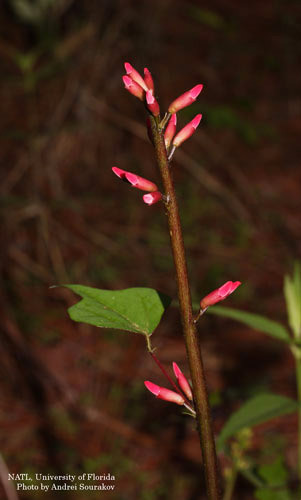 Coral bean, Erythrina herbacea, a host plant of Terastia meticulosalis Guenée and Agathodes designalis Guenée. Photographed during May at Gainesville, Florida. Photograph by Andrei Sourakov, University of Florida. Figure 30. 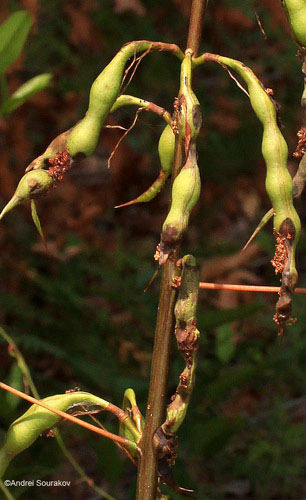 Coral bean, Erythrina herbacea, plant in late Spring (June) following an infestation, with pods hollowed by larvae of Terastia meticulosalis Guenée. Photographed in Gainesville, Florida. Photograph by Andrei Sourakov, University of Florida. Figure 31. 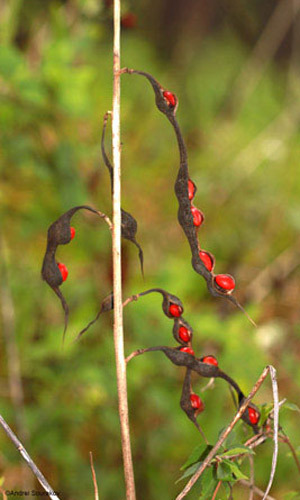 Coral bean, Erythrina herbacea, a hostplant of Terastia meticulosalis Guenée, as seen in August with pods open and seeds exposed. Photographed in Gainesville, Florida. Photograph by Andrei Sourakov, University of Florida. Terastia meticulosalis is a serious pest of naturally-occurring and commercially grown Erythrina, a genus valued for its many uses from agricultural and ornamental to medicinal and pest control (Powell & Westley 1993). Raven (1974) suggested that Terastia meticulosalis makes the cultivation of Erythrina in southern Florida almost impossible. Despite its small size, Terastia meticulosalis requires a substantial amount of plant material to develop to the adult stage, including seeds. 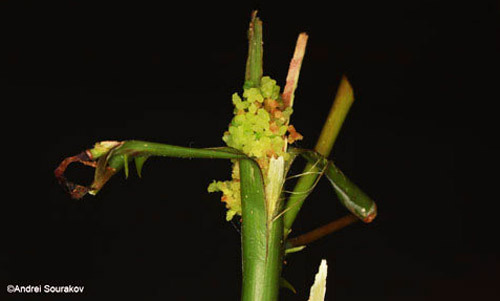 Plants can be substantially damaged by larvae boring into the center of the stem, killing parts of the plant above. As a result, the health of host plants can be severely affected and the whole plant, or at least its reproductive organs, are often destroyed. Agathodes designalis has a marginal effect on Erythrina herbacea, though it can destroy flowers, making coral bean less attractive as an ornamental. Bhattacharya DP, Mandal DK. 1976. A new record of Terastia meticulosalis Guenée (Lepidoptera: Pyralidae) from the Gt. Nicobar Island. Newsletter Zoological Survey of India 2: 23-24. Brown SH. 2011. Erythrina herbacea, Coral-bean, cardinal-spear, Cherokee-bean. Lee County - Southwest Florida (5 April 2013). Bourquin F. 1932. Observaciones biológicas sobre Agathodes designalis (fam. Pyraustidae). Revista de la Sociedad Entomológica Argentina 5: 13-14. Bourquin F. 1945. Observaciones biológicas sobre Agathodes designalis. pp. 117-119. In Mariposas argentinas. Vida, desarrollo, costumbres y hechos curiosos de algunos lepidópteros argentinos. Buenos Aires. 212 pp. Dyar HG. 1901. Descriptions of some pyralid larvae from southern Florida. Journal of the New York Entomological Society 9: 19-24. Goff R. 2011. Terastia meticulosalis Guenée, 1854. African Moths (5 April 2013). Heppner JB. 2007. Lepidoptera of Florida, Part 1: Introduction and catalog. Arthropods of Florida and neighboring land areas. Vol. 17. Florida Department of Agriculture, 670 pp. Janzen DH, Hallwachs W. 2011. Area de Conservación Guanacaste (ACG), northwestern Costa Rica: Caterpillars, pupae, butterflies & moths database. (5 April 2013). Peck SB, Heraty J, Landry B, Sinclair BJ. 1998. Introduced insect fauna of an oceanic archipelago: The Galápagos Islands, Ecuador. American Entomologist 44: 218-237. Powell JA, Opler PA. 2009. Moths of Western North America. University of California Press, Berkeley, 369 pp. Powell MH, Westley SB. (editors). 1993. Erythrina Production and Use: A Field Manual. Nitrogen Fixing Tree Association. Paia, Hawaii. 55 pp. Raven PH. 1974. Erythrina (Fabaceae): Achievements and opportunities. Lloydia 37: 321-331. Sourakov A. 2011. 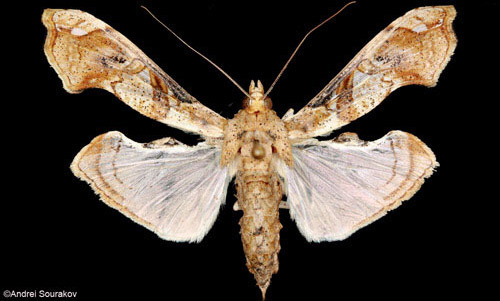 Niche partitioning, co-evolution and life histories of Erythrina moths, Terastia meticulosalis and Agathodes designalis (Lepidoptera: Crambidae). Tropical Lepidoptera Research 21: 84-94. Swezey OH. 1923. 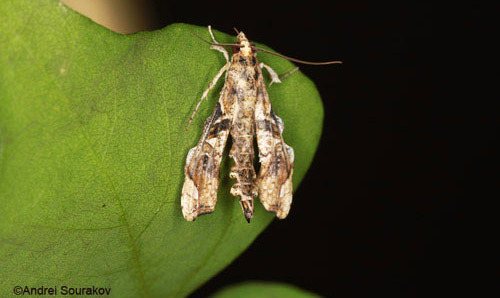 The Erythrina Twig-borer (Terastia meticulosalis) in Hawaii (Pyralidae, Lepidoptera). Proceedings of the Hawaiian Entomological Society 5: 297-298. Taylor JS. 1951. Notes on Lepidoptera in the eastern Cape Province (Part II). Journal of the Entomological Society of Southern Africa 14: 94-126. USGS. (April 2006). Erythrina herbacea. Geology and Environmental Change Science Center (5 April 2013). Zimmerman EC. 1958. Insects of Hawaii: A Manual of the Insects of the Hawaiian Islands, including an Enumeration of the Species and Notes on their Origin, Distribution, Hosts, Parasites, etc. Volume 8 (Lepidoptera: Pyraloidea). University of Hawaii Press, Honolulu. 456 pp. Author: Andrei Sourakov, University of Florida, Florida Museum of Natural History. Photographs: Andrei Sourakov, Florida Museum of Natural History, University of Florida. Publication Date: January 2012. Reviewed July 2017.